Most childhood deaths and disabilities are associated with trauma. According to Morganti-Kossmann et al., the United States records about 3000 infant deaths, 50,000 hospitalizations and approximately 700,000 emergency department visits each year (16). Minor head injuries, also referred to concussion is the trauma-induced alteration of brain functions that might or might not cause loss of consciousness in the affected person. Infants have higher chances of suffering from minor head injuries because they involve in various sporting activities that subject their heads to various types of forces. Head traumas occur mostly among children between the ages of 0 to 14 years (Morganti-Kossmann et al 22). In developing countries, traumatic brain injury (TBI) is the most common cause of infant deaths and childhood disability. Young male children have higher chances of acquiring TBI. The most common cause of minor sport head injury is a blow to the head that occurs when a child falls while playing (Dunning et al. 764). The clinical approaches to children reported with this case are different depending on the impact of the blow. However, most clinicians recommend the patient to undergo a computed tomography (CT) imaging in order to determine the impact of the injury. Most clinical specialists try to save excessive costs related to admission and unnecessary diagnostic tests by doing a quick screening with an assumption that the injury is minimal. Clinicians should accurately diagnose a child with any type of head injury and carryout and give the correct medication because an infant head is delicate and can lead to complications by ignoring a small problem. The head of an infant is proportionally larger in comparison with the body size. Clinician’s aim in evaluating head trauma is to accurately identify and diagnose a patient whose life is a risk because of a serious head injury. Primary brain injuries demand early diagnosis and through treatment in order to prevent secondary injuries that are extremely dangerous (Davies et al. 34). Infants who seem depressed and unconscious after a head injury present an easier diagnosis that those who are fully conscious because the evolving injury seems harder to identify. Out of the many studies conducted on the prevalence of minor head injuries in the United States population, only 9.1% of the population aged between 0 to five years recorded most affects. The study carried out in 2012 showed that 1 out of 11 infants in U. S. are diagnosed with minor head injuries. A survey carried out by Schutzman, showed that 4.7% of U.S. population suffered from ICI (Schutzman). In United Kingdom, 55% of minor head injuries occurred in children below the age of five years, with 28% younger than two years. Out of this population, male children accounted for 65% (Dunning et al. 764). Children with minor head injuries account t for 40-60% of traumatic brain injuries as seen on CT, with only an average of 4% of these scans giving positive results. In addition, clinically significant cases of radiographic intracranial injuries (ICIs) require close interventions such as incubation, hospital admissions or neurosurgery (Stein et al. 470). Exposure to radiotherapy radiations has been associated with a lifetime risk of cancer. Younger children are at higher risks of acquiring cancer from exposure to head CT scan radiations because of high effective organ dose of radiation. Statistics show that approximately 20% of CT scan related cancer occurs to children under that age of 2 years (Stein et al. 476). The healthcare department has introduced a rule requiring clinicians to make an accurate decision on children with head injuries who undergo a safe CT scan (see fig. 1 and fig. 2). The government introduced these rules of selective imaging infants and children because of the following. Figure 1. 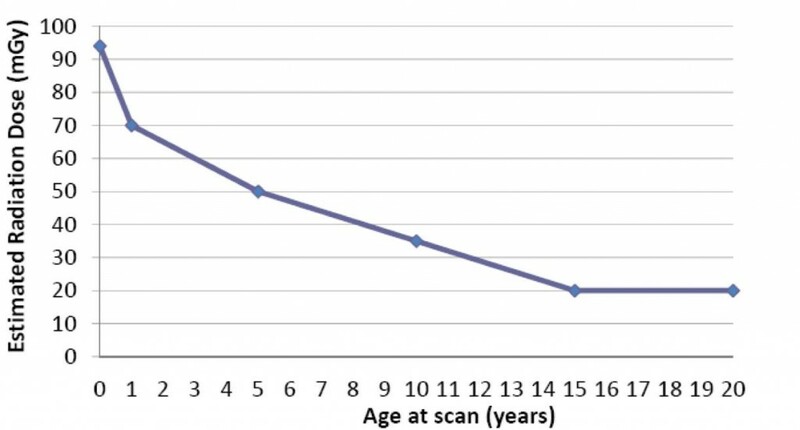 Estimated organ-specific brain radiation dose for head CT by age (Brenner). Figure 2: Estimated lifetime attributed risk of death from cancer because of head CT by age (Brenner). Firstly, there is a need to identify infants with clinically brain injuries that require early intervention. Secondly, there is a need to reduce unnecessary CT scan, surgeries and admissions (Davies et al. 67). Most discussions about head traumas in children focus on sport-related injuries. The International Conference on Concussion in Sports (ICCS) is a body that conducts researches on various head injuries caused in sporting activities. The conferences held in 2001, 2004, and 2008 concluded that more than half of all head injuries were sport related. In U.S., about 10 young people suffer a fatal blow to the head, mostly caused by subdural hematoma. Studies show that most fatal head injuries occur due to extradural hematoma (Morganti-Kossmann 56). Parents should be warned against allowing their children to return to play after a brain injury diagnosis because of the following. Firstly, the child’s full and fast recovery might be delayed because they require extra physical and cognitive rest. Secondly, a child might have trouble in concentrating and have slow reaction times that have the potential of exposing the child into higher risks of additional injuries. Finally, involvement in plays after a head injury might result into repeated injuries that eventually cause cumulative effects. A child who endures a second head impact while recovering from the first injury might lead into massive brain oedema resulting into high fatality rate. Young children pose a very challenging evaluation procedure because they have delicate bones and skins. In most cases, there are few or no clinical findings even with the use of CT scans. Almost 50% of infants suffer loss of consciousness after a head injury, but many have just a scalp hematoma upon physical examination. 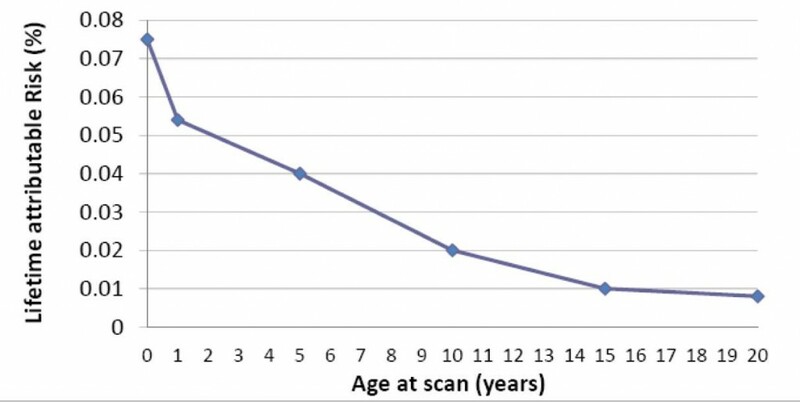 The probability of obtaining imaging studies increases with age. Moreover, the higher the number of signs and symptoms, the stronger the ability of obtaining imaging studies on patients (Stein et al. 480). Advancement in technology has led into the introduction of newer imaging modalities, like the diffusion tensor imaging FMRI and PET scans. Once a child is taken to a doctor because of a blow in the head, the doctor examines him or her for any of the following: hearing, memory and concentration, balance, coordination, reflexes, sensation and strength, vision (Stein et al. 481). Presence of either any of the above intermediate-risk factors (Schutzman). On the other hand, skull radiographs are used to screen for a fractured bone in patients 3 to 24 months old and should be conducted by an experienced pediatric. Management of minor head injuries starts by diagnosis. The most common symptoms of an infant suffering minor head injury are described in the following three groups: cognitive problems, physical symptoms and physical signs. Cognitive problems. The symptoms include impairment of short memory, confusion, amnesia, and loss of consciousness. For children who can speak, short, intermediate or long-term memory is tested with standardized questions. Examples of such questions are the type of team who were playing, the venue of the match, or the winners of the match. Physical symptoms. These include headache, vomiting, nausea, dizziness, ringing in the ears and visual disturbances. Physical signs. These include low level of consciousness, seizures, lack of coordination, slow in obeying commands, inappropriate or decreased play, slurred speech and inappropriate emotions. Once any of the above signs are seen on a child, the doctor should take immediate measures in order to save the child from major injuries that occur because of delayed ICI treatments. The following are the recommended early management of a concussed child. Firstly, the child should be restricted of all physical activities. Cognitive rest is necessary with activities such as watching television, playing videos games, and reading should be avoided until the child symptoms eases. Moreover, educating children inform of explanation and reassurance combined with providing symptom-related information helps families cope with cases of head injuries and speed up recovery. Secondly, parents should avoid buying medicine in pharmacies without a doctor’s prescriptions to treat their injured infants. These include treatment of symptoms such as headaches. According to Comper et al., pharmacological studies have failed to give clear evidence about the effectiveness of specific drugs for the treatment of minor head injuries without a CT scan (870). Although, sertraline manages concussion-related depression while dihydro-ergotamine manages concussion-related headaches a thorough confirmation is necessary before administering these drugs. During the third ICCS, the differences between simple and complex brain injuries were abandoned. The board members came up with “modifying factors in trauma management.” Some of the modifying factors discussed included the duration of symptoms for more than 10 days, initial loss of consciousness of more than a minute, repeated concussions, pre-morbid conditions, dangerous playing styles, and high-risky sports. Patients with such factors require additional investigations once diagnosed with head injuries such as balance assessment and neuropsychological testing. Moreover, such children should be referred to a sports physician or neurologist for injury management (Schutzman). Generally, children have modifying factors. Balance testing is the most recommendable sensitive indicator of recovery in infants. The process uses sophisticated equipments; it only requires a child to pirouette 3 times while making a forward movement. Neuropsychological testing is common in adults although sometimes it is done to children between the ages of 9 and 15. Neuropsychological and balance testing are desirable for children because cognitive recovery lags behind the resolution of physical symptoms. However, professional clinicians should conduct neuropsychological testing on children. What are the risks of a minor head injury? Minor head injuries in infants leads to many problems if not diagnosed. Some common risks associated with minor head injuries include blood clot in the brain. In addition, each additional injury in the head of a child increases his or her risk of long-term problems that may include trouble in thinking or concentration, poor coordination and disability. 1. The person shows a sign of distress or unacceptable consequences in different aspects of his or her life. 2. Symptoms must are seen in at least two of the following areas: (a) emotions (the appropriateness and range of emotional functioning); (b) interpersonal functioning (relationship with others and social status); (c) thoughts (how the person views the world, how the person thinks about oneself and others, level of interaction); (d) impulse control. The most common physical prevention measures for head injuries include helmet use while the child involves in any kind of play. Children who play with their helmets on record reduced cases of head injury. Secondly, parents should be educated on how to take care of their children in terms of providing them with more teachings about dangers of minor head injuries, sport-related trauma and sport safety. In addition, advocacy plays a significant role in preventing increased cases of head trauma among young children. Through increased awareness, people have come to understand dangers associated with child plays. Moreover, a wider use of standard assessments and state legislations has proved a perfect way of preventing or minimizing trauma related cases (Davies et al. 102). Children and infants who suffer minor head injuries should undergo the following recommended physical rehabilitations. A physiotherapist with neurological experience should be used to coordinate physical therapy in order to increase the functioning of people with traumatic brain injuries. In addition, before conducting any physical treatment, the orthopedic or musculoskeletal injuries must be taken into account. Moreover, a physical rehabilitation program should incorporate written and an illustrated plan in order for the other new team members adapt easily. Finally, a speech-language therapist with dysphasia expertise is recommended for conducting dysphasia therapy (Writer, et al. 843). Infants and young children are much prone to fatal head injuries that occur as they play. Parents should be responsible for their young ones in order to avoid the occurrence of such incidences. In case an accident does occur, the parent or caregiver should take the necessary actions as discussed above in order to save the child from secondary trauma effects. Head injury, no matter how small it is has a very serious impact in the normal functioning of a human being. Children are delicate beings who should be held by care in order to avoid damaging their growing tissues. Clinicians have a duty of ensuring they conduct an effective and thorough diagnosis and treatment once faced by trauma cases. On the other hand, parents should adopt the above discussed prevention measures in order to minimize the number of cases reported in state hospitals annually. Brenner, David, Eric Hall. “Computed Tomography – An Increasing Source of Radiation Exposure.” The New England Journal of Medicine, vol. 357, no. 22, pp. 77-84, 2007, http://www.nejm.org/doi/pdf/10.1056/NEJMra072149. Accessed 19 Dec. 2017. Comper, Paul, S. M. Bisschop, N. Carnide, and S. A. Tricco. “A Systematic Review of Treatments for Mild Traumatic Brain Injury.” Brain Injury, no. 19, pp. 863-880, 2005. Davies, Ffion, Collin E. Bruce and Kate J. Taylor-Robinson. Emergency Care of Minor Trauma in Children. CRC Press, 2011. Dunning, J. et al. “The Implications of Nice Guidelines on the Management of Children Presenting with Head Injury.” Archives of Disease in Childhood, vol.89, no.8, pp. 763-767, 2004. BMJ Journals, http://adc.bmj.com/content/89/8/763. Accessed 13 Nov. 2017. Morganti-Kossmann, Cristina, Ramesh Raghupathi and Andrew Maas, editors. Traumatic Brain and Spinal Cord Injury. Cambridge University Press, 2012. Schutzman, Sara. Minor Head Trauma in Infants and Children: Evaluation. UpToDate, www.uptodate.com/contents/minor-head-trauma-in-infants-and-children. Accessed 19 Nov. 2017. Stein, S. C., R. W. Hurst and S. S. Sonnad.“Meta-Analysis of Cranial CT Scans in Children. A Mathematical Model to Predict Radiation-Induced Tumors.” Pediatr Neorosurg, vol. 44, no. 6, pp. 448-570, 2008. Writer, B. W., J. E. Schillerstrom, H. K. Regwan and B. S. Harlan. “Executive Clock Drawing Correlates with Performance-Based Functional Status in People with Combat- Related Mild Traumatic Brain Injury Comorbid Posttraumatic Stress Disorder.” Journal of Rehabilitation Research & Development, vol. 47, no. 9, pp. 841-850, 2010.